You are at:Home»The Property Investor Thought-Leaders»How high do rates need to go to stop investors? Ground-breaking new research has discovered how high interest rates need to go before investors retreat from the market. RiskWise Property Review has created a new data-modelling tool that can help predict investor activity to assist with future planning requirements. 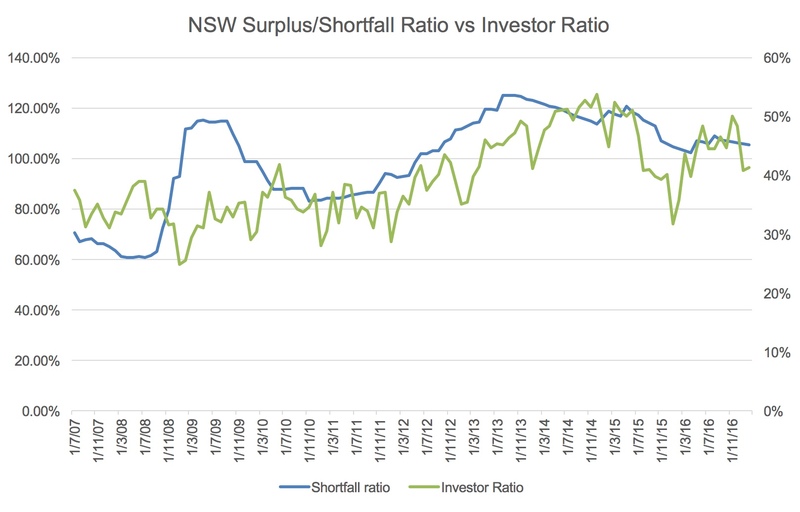 The Surplus/Shortfall Ratio (SSR), which is the ratio between the gross rental return and the funds required to service a mortgage – based on a 80 per cent loan to value ratio (LVR) and the discounted variable rate as published by RBA – aims to take the guesswork out of investor demand forecasting. RiskWise Property Review founder Doron Peleg said the current RBA cash rate of 1.5 per cent is at a historically low level. In the current economic environment of low inflation, sluggish GDP and poor wage growth, the RBA has not increased, and will very likely not increase, the cash rate in the next 12 months. “The share of property investors has significantly increased during the past five years and have had a major impact on the increased dwelling prices in our major capital cities,” Mr Peleg said. 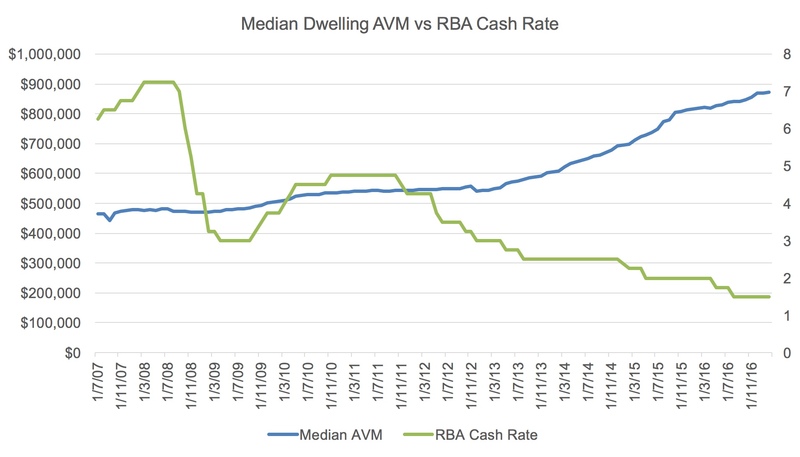 It is well known that there is a strong correlation between a reduction in RBA cash rate and the median dwelling prices, as is outlined in the graph below. The RBA’s hands are tied, as they can’t increase the cash rate due to current economic conditions, he said. 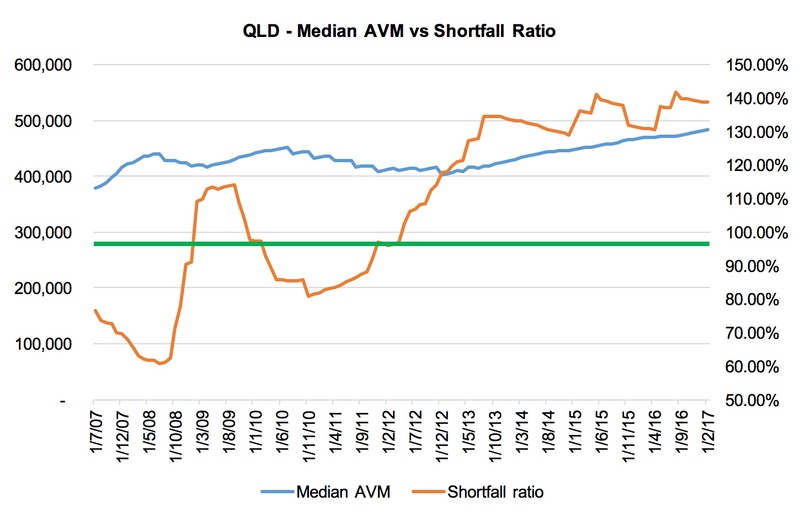 Therefore, in order to decrease demand by investors, APRA and the major lenders have set measures to reduce the share of property investors in the market*. 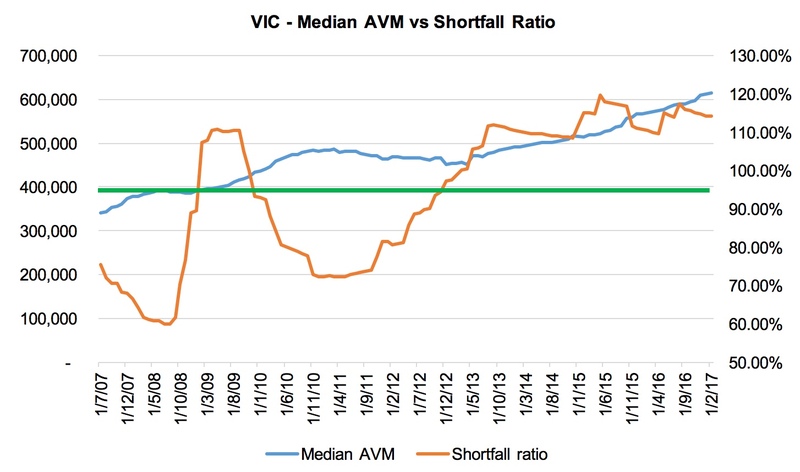 A higher interest rate that will have a significant impact on the “out-of-the-pocket” amount will have a greater impact than customer sentiment and capital growth expectations, particularly in the Sydney and Melbourne markets. No changes are made to negative gearing or to re-finance arrangements. What is the estimated increase in interest rates that is required in order to reduce the share of investors in the market? Is the impact expected to be different among our major capital cities? What is the projected impact for each scenario? At what point are prices projected to stop increasing and at what point will they actually start decreasing? RiskWise has created its Surplus/Shortfall Ratio (SSR), which is the ratio between the gross rental return and the amount that is required to service a discounted variable loan, based on a 80 per cent LVR. It also assessed whether there is a clear correlation between the SSR and the rate of investors in the property market as a percentage of all property buyers. That is, the greater the proportion of investors, the greater the demand, and the greater the changes in median dwelling prices. “One major challenge we faced in compiling this research is that the current interest rate environment is effectively ‘unchartered’ territory,” Mr Peleg said. However, he said, the research garnered enough meaningful insights for RiskWise to create the SSR. Perhaps unsurprisingly, a clear correlation was identified between the SSR and the number of investors in the market. In other words, the higher the ratio (i.e. the lower the “out of the pocket” expenses for an investor), the greater number of investors in the market, he said. 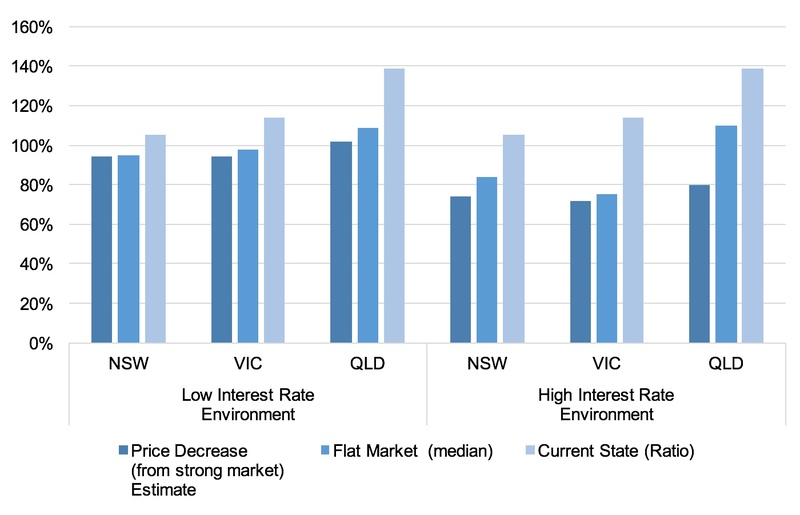 This correlation was found in all three markets that were reviewed, which were New South Wales, Victoria and Queensland. RiskWise Property Review also identified two different ranges of “equilibrium points” across all three markets – one for a high interest rate environment and the other for a low interest rate marketplace. “We have made this distinction because our research highlighted a meaningful difference,” Mr Peleg said. However, he said, in a low interest rate (i.e. low growth) environment, investors are more cautious and require a higher SSR to remain comfortable with their exposure to risk. Landlords understand that they may also struggle to justify higher rents with similar changes to cost of debt in this environment. Note: the equilibrium point does not take into consideration a sudden increase in the number of dwellings in the pipeline and their impact on a specific area. c) 150 basis points (i.e. 1.5%) for QLD. Yes, the “trigger points” vary in each market, as discussed above. These variations take into account the different capital growth expectations in each State. 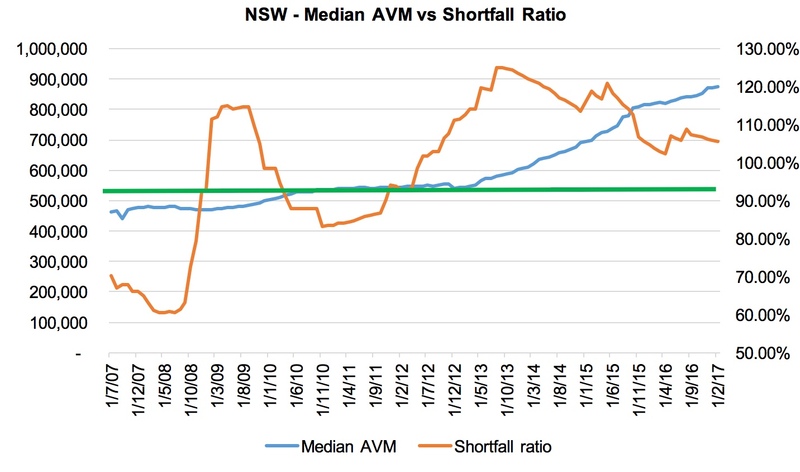 In NSW, where capital growth expectations are higher, the equilibrium SSR point is lower, and vice versa in Qld. The current SSR across these three markets today is higher than the equilibrium point for a very moderate market. This groundbreaking new research can help take the guesswork out of broader economic modelling and allow us to predict what market conditions need to be present in order to “trigger” the property market in a new direction. The data is immensely valuable to individual investors who are preparing their next move, and to policy makers, industry professionals and corporations who wish to gain insights into where markets are heading – and the impact it could have on property values and investor activity. *The regulator has set macro prudential measures that have a direct impact on property investors, including setting a ‘speed limit’ of 10% increase in the loans to property investors. Other macro prudential rules for the banks also have a direct impact on investors and these are: The limitation of interest-only loan to 30% of total loan books (currently 40%) and the reduction in the number of interest-only loan with an LVR above 80%. A few of the major lenders have increased interest rates for investment properties, higher than the interest rate for owner occupiers. These measures are applied across the board, with little to no distinction between the capital cities and they are, effectively, equivalent to an interest rate increase to property investors. Note that the macro prudential measures and specific measures that have been recently presented by the major lenders are not included in this analysis. The aggregated impact of these measures are estimated as an interest rate increase of 0.2 to 0.3 percentage points. Also note that the recent stamp duty concessions for first homebuyers that have been announced by the New South Wales and Victorian governments have not been taken into consideration. Those changes are likely to increase demand from first homebuyers and drive prices up, particularly at the lower end of the market.